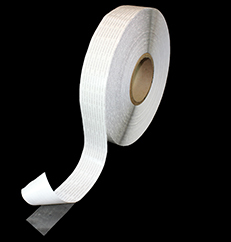 Our new Griffolyn® Double-Sided Bonding Tape is constructed of a solid low stretch core film coated on both sides with a clear synthetic rubber adhesive, which is optimal for in-field fabrication and patch work. and should be adhered between Griffolyn® layers for best results. Additionally, our customers who use our Griffolyn® heat shrinkable Griff-Shrink™ products will also find value in the Griffolyn® Double-Sided Bonding Tape to adhere and secure layers prior to or after heat shrinking covers with a heat shrink gun. Furthermore, this clear adhesive tape is weather resistant to withstand outdoor temperatures and is ideal to complement over-the-road equipment covers, outdoor shipping covers, pallet covers and a thousand other possibilities.